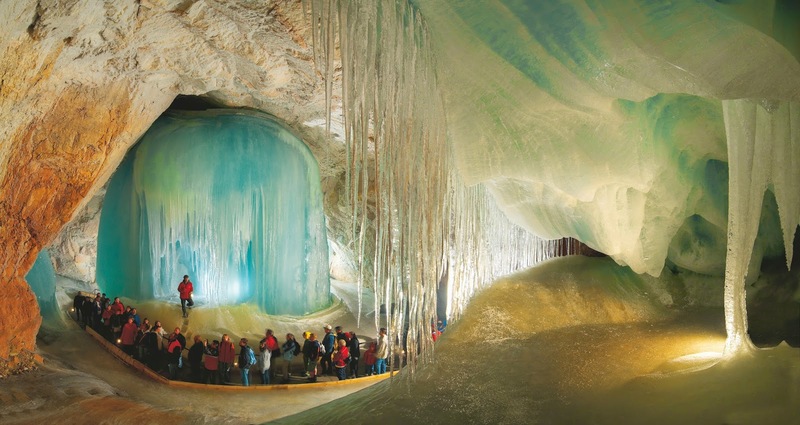 When you hear about Austria, people probably know it for Salzburg and Vienna, but did you know that Austria has the world's largest ice cave? Discovered by Anton von Posselt-Czorich in 1879, but was quickly forgotten and rediscovered in 1913 and has since become a tourist attraction. Located in Werfen, it is open from May to October and is only available by tour which lasts 1 hour and 15 minutes. The total suggested visit time is 3 hours though due to the time spent getting to the cave itself (either on foot or by cable car which was built in 1955). The tour itself is not for everyone since there is an altitude gain of roughly 134 meters (or 440 ft) during the tour. Do note that photography and videos are prohibited here. The explanation is due to how tightly packed the tours are, it would cause a huge backlog of people and flash impacts the cave experience. As of this post, tours are scheduled at least once every full and half hour. The ticket office is open from 8:00 am - 3:00 pm (for September). Reservations not available. For 2015, it costs 22 euros for cave visit + cable car or 11 euros for just cave visit (with an estimated 1.5 hr footpath without cable car). Tours from Salzburg costs roughly 50 euros per adult and doesn't include the entrance fees. Distance by car is roughly 1 hour and by train is roughly the same.